The ancient city occupies an area of 400 square kilometers, which includes a large wooded area. 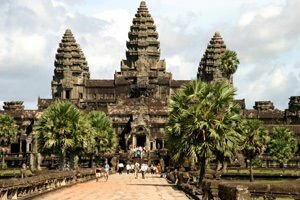 Here they were able to largely preserve the ancient Khmer ruins of several empires over the period from 9th to 15th century. 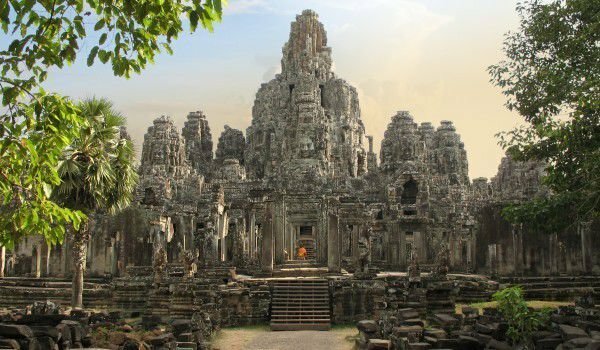 The most notable archaeological monuments are temples of Angkor Wat, Angkor Thom and Bayon Temple. These Khmer temples are located in two groups. The first is in the area of Roluos which is about 16 km to the east of Siem Reap. Here you can see some of the earliest religious structures, because the area was the first Khmer capital of Angkor. 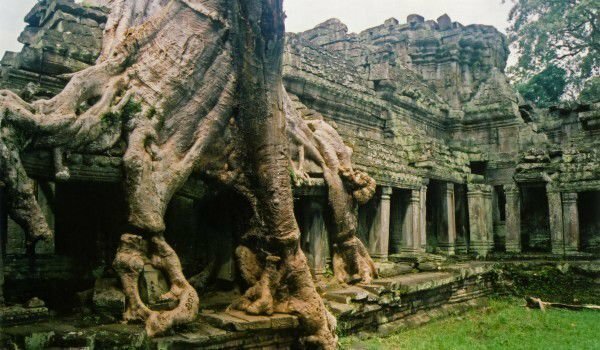 In the ninth century the capital, was shifted from within the Angkor ruler Yasovarman I.
Temples at Angkor are over a thousand, ranging from plain brick piles and debris scattered across rice fields to the magnificent Angkor Watt, which allegedly is the largest religion in the world momument. Built entirely of stone the palace dates from the 12th century, and was built by the order of Suryavarman II. At the main temple in the village is Bakong which was built in the late 9th century, it represents a giant piramid building that has base of 55 meters long. The most convenient way to get to the ancient city is to land at the airport of Phnom Penh on a flight from Bangkok, Moscow, Hanoi, of Saigon. From Siem Reap complex it is about 20 minutes by car or bike in the north, but there are many of the necessary facilities for tourists such as accommodation, hotels, shops and restaurants.